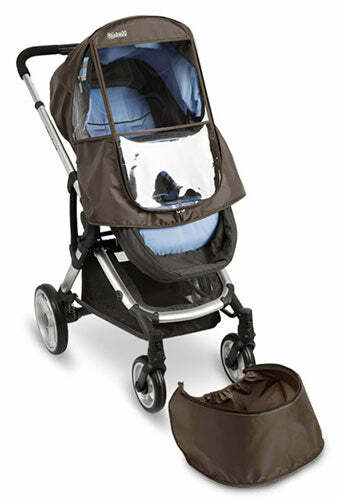 Foot-cover prevents the cold air to pass through the bottom front of the stroller. 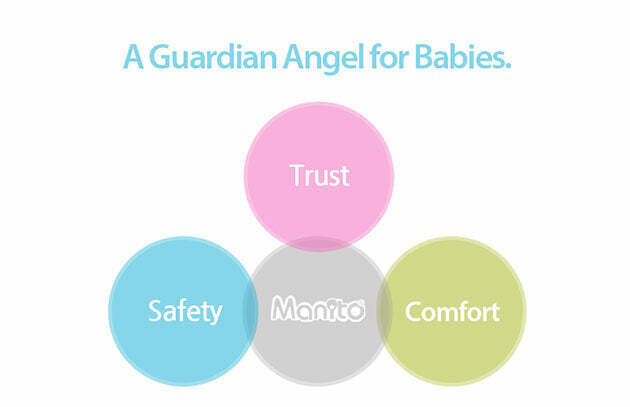 Foot-cover is constructed so that it completely wraps around the baby's feet and elastic S-Hooks seal the gaps to provide warming environment. 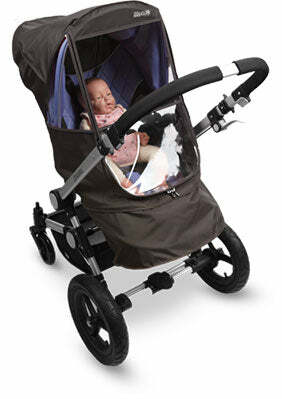 Adopting the characteristics of detachable seat strollers, the cover is custom designed to fit on the seat so that it can be detached from the stroller's frame to switch to front or rear-facing position without removing the cover. 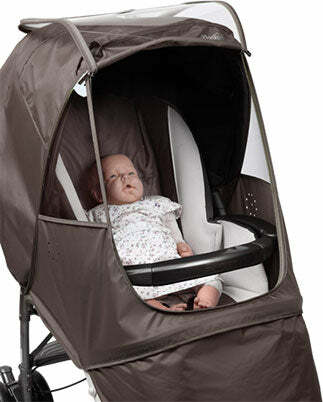 Since the cover and the seat are independent to the stroller's frame, seat can be adjusted to any desired recline position without any obstruction of the cover. 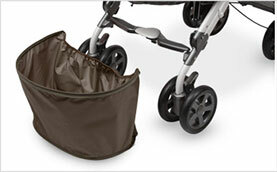 Detachable foot-cover can easily be removed from the main body of the cover for convenience when cleaning. 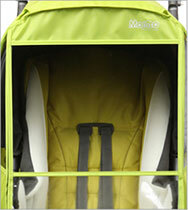 Open the zipper to completely separate the foot-cover from the weather shield to wash and clean. 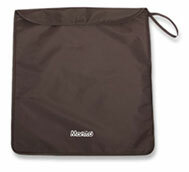 (It's highly recommended to use a wet towel to clean) Since it's coated fabric, it's recommended to hand wash with lukewarm water and small amounts of detergent and air dry in a shaded area. 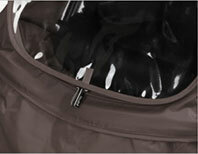 Do not use bleach or any other chemical agents as decolaration may occur. 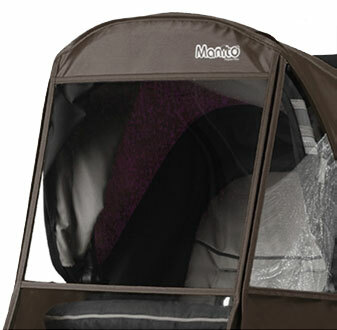 To protect babies' eye-vision, Manito introduced refraction free, flat surface UV resistant optical sheet on the stroller covers. 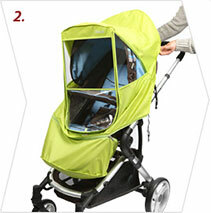 It provides clear non obstructed views so that your baby can see outside clearly when inside the stroller. 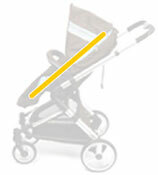 Optical distortion or refraction may cause dizziness and stress in the eyes. 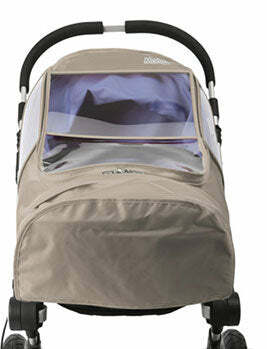 Refraction free flat surface clear windows aid your baby's vision. 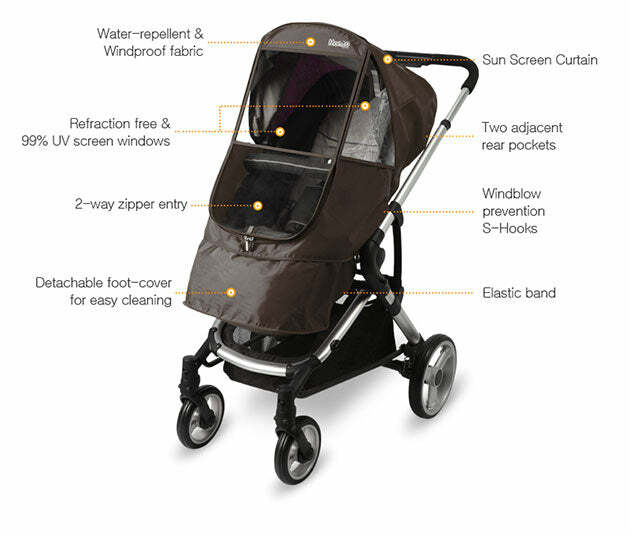 When the weather is cold and sun is out or when baby is asleep, easy pull-up and pull-down Sun Screen Curtain provides extra sun protection and comfort for the baby inside the stroller. 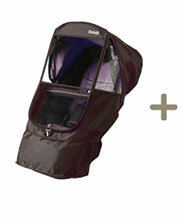 Front window with two-way zipper provides easy in-and-out of your baby without the hassle of removing the cover. 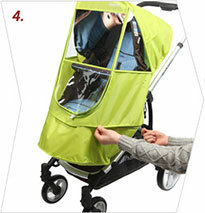 Also, easy to attend the baby anytime anywhere. 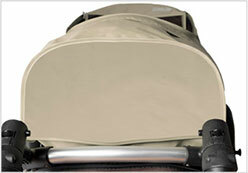 Cover is equipped with elastic S-Hooks to secure the cover onto the stroller. 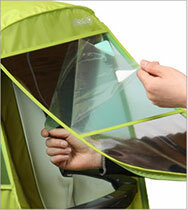 It prevents the cover being blown off from strong wind. 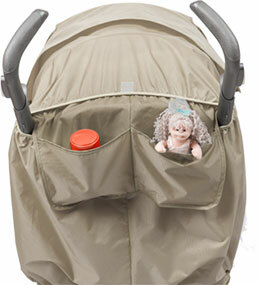 Two adjacent convenience pockets in the rear is suitable for carrying baby essentials. 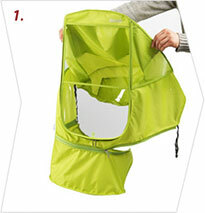 Conveniently fold the cover and use the included portable pouch for easy storage and carry when not in use. 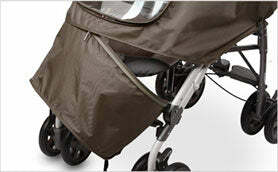 Elegance Beta Stroller Weather Shield can be used regardless the seating direction of the stroller. 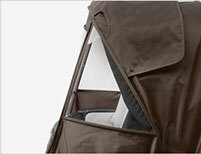 It can also be used in any seat recline angles. 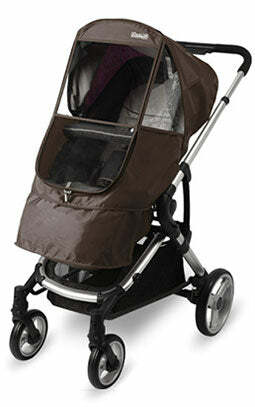 Specially designed to fit on detachable seat strollers that recline flat and reversible (forward and rear facing). 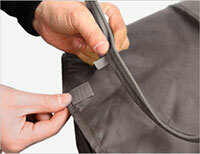 After spreading open the cover completely, partially open the zipper where the foot-cover is attached. 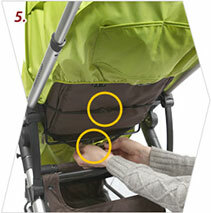 Fit the top area and make sure the canoly is fully extended. 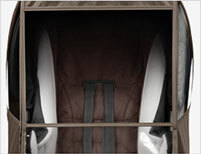 Close the zipper of the foot-cover. 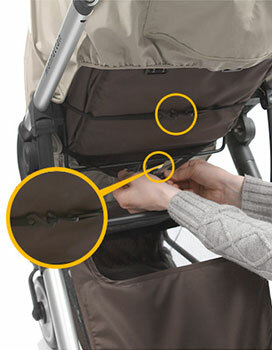 Use the two pairs of S-Hooks to secure the cover onto the stroller. 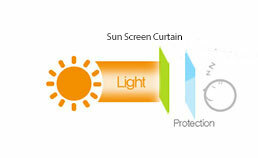 Make sure to peel off the blue protective films on te windows before using the product. 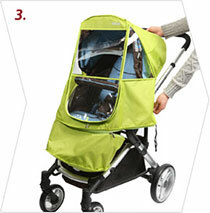 By doing so it will provide clear vision through the windows and protect baby's eye-vision when inside the stroller. There are two films on each window. 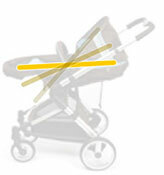 (One in front and one in the back, total of six films must be removed before using). 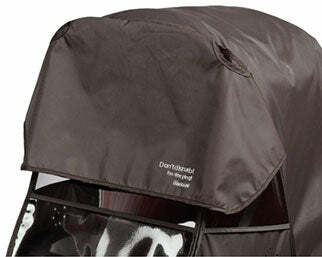 Do not use this product other than stroller weather shield / rain cover purposes. 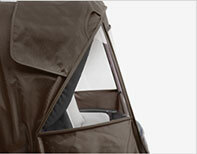 It is intended to be used to protect against cold, wind, rain and snow. 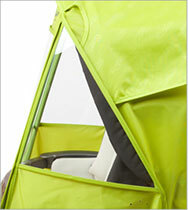 This product is NOT intended to be used in the hot summer days except in the rain. 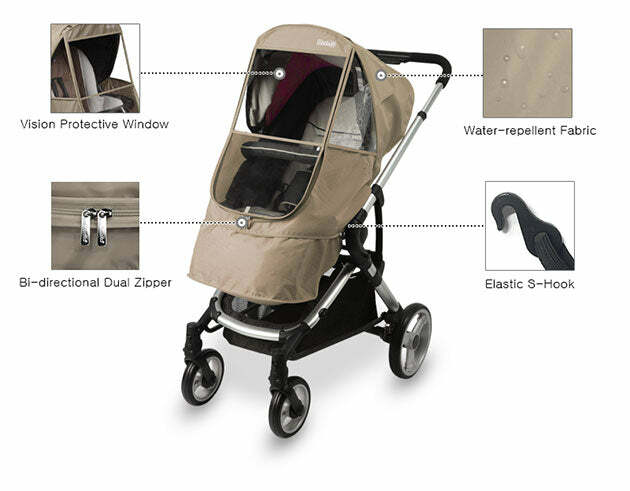 To avoid danger of suffocation and excessive temperature, never leave the child unattended with the cover fitted on the stroller. 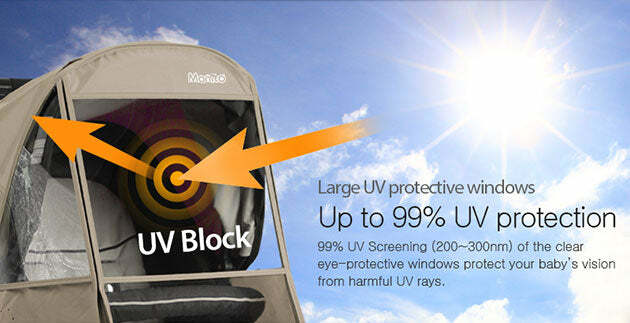 Note: Make sure to remove the protective films from every windows (inside and outside) before using the product to acquire clear vision and effective UV screening from the sunlight. Copyright © 2019 Manito USA. All rights reserved.